Phase two is complete and I am more than satisfied with it. Nevertheless, there are many things that can be added to this set. 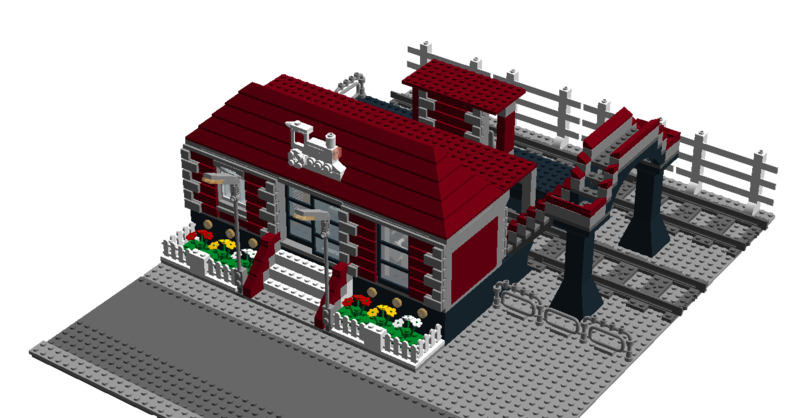 I have yet to post it on the Lego website. Between CAD designs and gaming, this little beauty has multiple sources of inspiration. The model sits on a 48x48 base plate adjacent to 3 road plates for coherence. There are three dominant exterior colours: the black, grey and burgundy bricks. 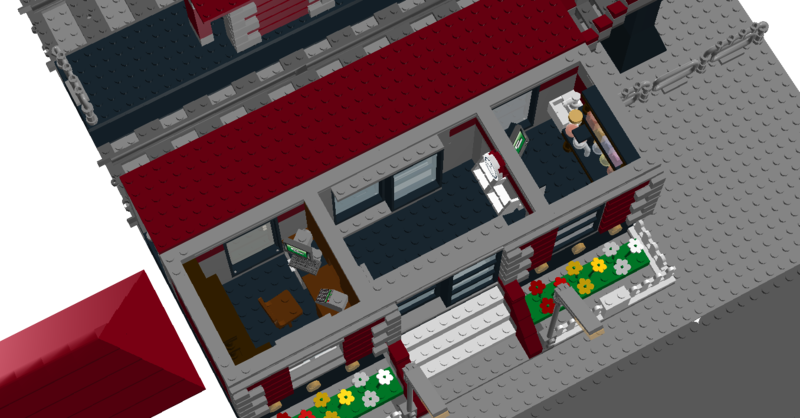 For some reason the black bricks look blue-ish when rendered by the Lego Digital Designer software. Smaller waiting area on the second platform. except for the bike rack but there is space on the side of the building for one. 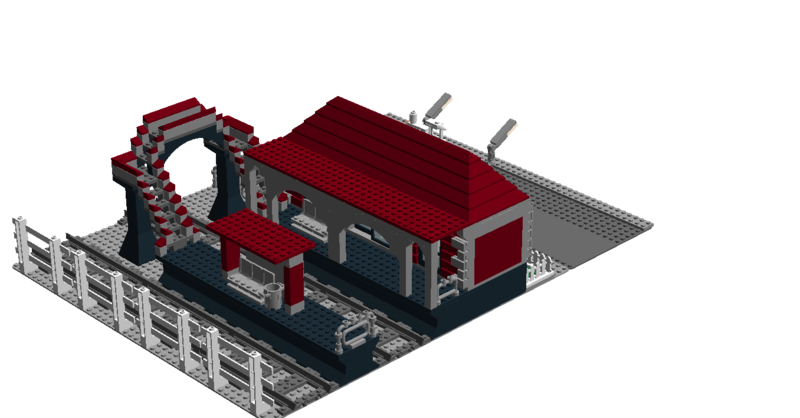 The burgundy and grey brick arrangement is similar to the fire station set. I feel it gives the build a bit more character and more coherent to the existing Lego sets I own. The round transparent bricks add a lighting effect on the flower beds. From the opposite angle the features of the overhead crossing are visible. I have added the fencings and rails to mark the end of the platforms. Do note that the covered waiting area is longer than in Phase 1. 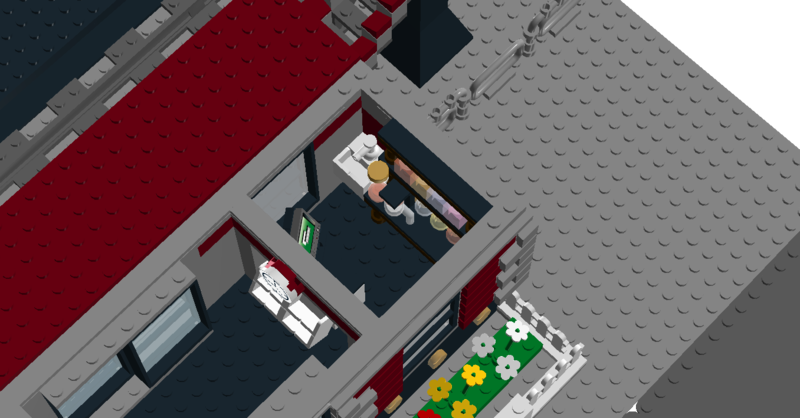 The 3 brick space is just enough for the train doors to open which was a relief when designing. The inside space has the ticket office with swivelling chair and computer and bureau drawers. The back wall of the office has a wooden table and shelf. The coffee shop has an angled display which for the life of me I could not get the software to fit flat squares on to represent chocolate bars and cookies. The back has a sink similar to the fire station set and the shelf has a coffee machine with multicoloured transparent bricks to represent the different flavours of shots that go in drinks. Lauren thinks it looks more like a pharmacy. Let me know what you think. There is no keyboards associated to the coffee shop since I wanted it to be more of a touch screen. 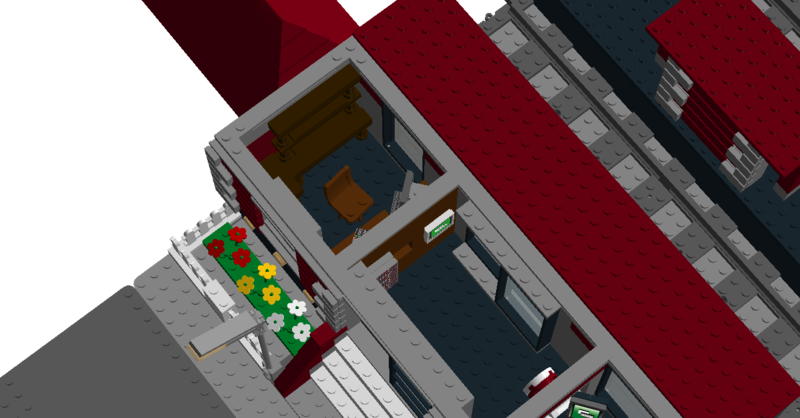 I can still include a few chairs on the inside for seating but decided against it for clarities sake. While it is not visible from the shots taken each platform has a digital clock under the covered platform. Let's post this on the Lego website and see what comes of it.